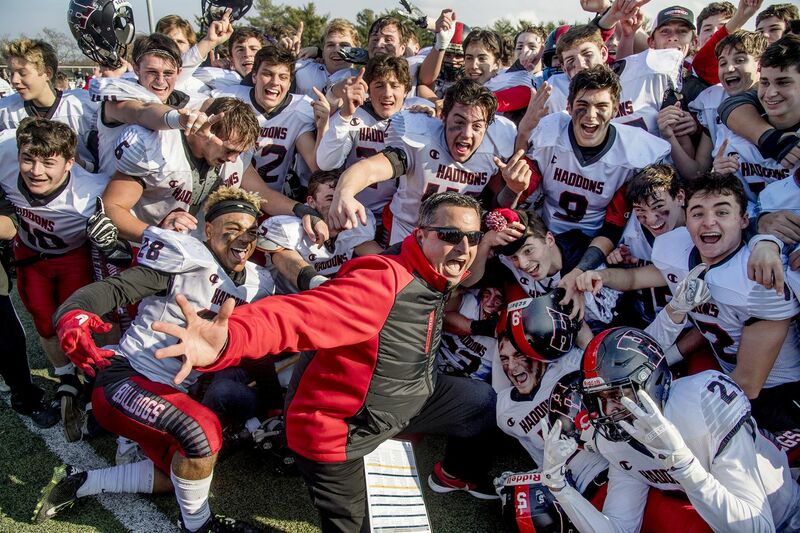 Haddonfield coach Frank DeLano and players celebrate after last year's victory over West Deptford in S/J. 2 title game at Rowan University. Last season: 9-3, won South Jersey Group 2 title. Coach: Frank DeLano (120-55 entering his 17th season). John Foley celebrating after scoring a TD against Cinnaminson in last year’s S.J. 2 semifinals. The Bulldogs in 2017 won their fourth South Jersey Group 2 title since 2010. But it might have been the most remarkable season in recent program history in this sense: The team looked nothing like a future sectional champion when the playoffs began. At that point, Haddonfield had lost three in a row, scoring just a field goal in an unsettling setback at Cedar Creek and getting clearly outplayed by division and S.J. 2 rival Sterling in the week before the start of the state tournament. But the Bulldogs caught fire in the playoffs, getting a big boost from the return to health of WR/DB Davis Smith, and stunned arch-rival West Deptford in the title game at Rowan University. This year's team is deep, talented and experienced. On paper, Haddonfield is the favorite in both the WJFL Colonial and S.J. 2 races. But 2017 is a cautionary tale: "You just never know," DeLano notes. Smith (6-2, 185), one of South Jersey's top all-purpose players who has offers from Air Force, Monmouth and Sacred Heart, leads the way this season along with a large group of classmates. Senior TE/LB Gabe Klaus (6-2, 225) was a first-team ASJ selection last season. He's an impact player on both sides of the football. The offense features senior QB Jay Foley (5-9, 175) and senior WR John Foley (6-2, 185), his twin and a top target. The roster is loaded with seasoned veteran seniors such as FB/LB Lance Forebaugh (5-11, 215), OL/DL Matt Pinsky (6-2, 245), TE/DE Drew Gavranich (6-2, 215) and senior LB Lewis Evans (5-10, 185). Senior RB/DB Chris Brown (5-10, 175), who missed last season with an injury, could be poised for a big season. Davis Smith intercepting a pass in last year’s S.J. 2 title game against West Deptford. Other key veterans include senior DL James Kane (6-3, 220), senior OL Vince Brady (6-3, 225), senior OL John Brady (6-3, 255) and senior K Henry Grozier (5-9, 165). Juniors of note include OL Nick DiNoia and DB Alex Kadar (5-11, 175), among others. Sophomore LB Glenn Foley (5-10, 190) is a young player to watch. The Bulldogs played all their "home" games last season at Cherry Hill West as their historic stadium was being refurbished. They are supposed to return to their field behind the high school this season, with the home opener Sept. 14 vs. S.J. 2 contender Cinnaminson. The season opens with an added ninth game Aug. 31 at Pleasantville, another S.J. 2 contender. The heart of the regular season is a six-day stretch from late September to early October. On Sept. 29, Haddonfield visits defending NP 2 state champion St. Joseph in a fascinating match-up of two of South Jersey's top small-school programs and two teams that apparently have never met in the sport. That clash is quickly followed by an Oct. 5 home game with West Deptford, a battle that almost always determines the division race and also carries major playoff implications. It also usually is a playoff preview, as the teams often meet again in the state tournament. Jay Foley (No. 2) is one of South Jersey’s top dual-threat quarterbacks. Jay Foley is the Baker Mayfield of South Jersey football, according DeLano. That speaks to the ability of Foley, the son of former CHE and Boston College star and NFL quarterback Glenn Foley, to make plays with his arm and feet while operating in an exciting, dynamic way. Foley passed for 1,729 yards and 14 TDs last season. But the stats only hint at his play-making ability. He extends plays with his mobility and exudes a fearless confidence. His dad was the same way, although obviously he was a much taller athlete. But that daring approach was the source of much of Glenn Foley's success, and the same is true for his son.